Milk production takes a lot out of a goat, whether she is feeding her kids or providing a commercial dairy product. Whether or not she's actually nourishing her young, that's what her body believes she's doing. Drying up a milk goat requires some basic management and feeding changes. 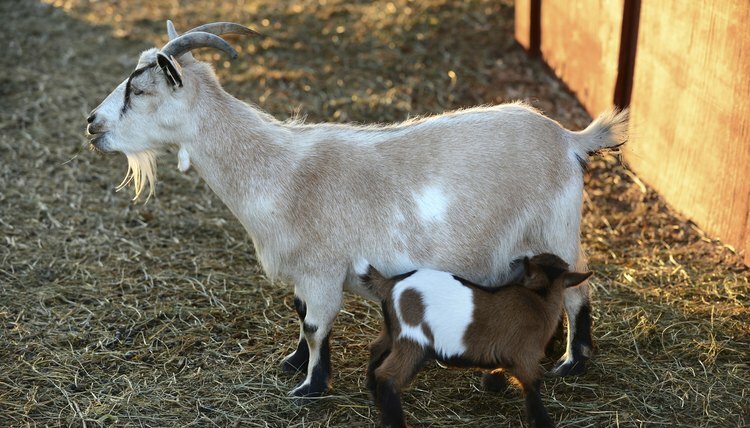 Goats used for dairy purposes generally have their kids removed soon after birth, with the babies raised on feeders. Regular milking keeps the dairy goat lactating and in production. If your doe nurses her kid or kids and isn't hand-milked, she'll eventually wean them naturally and subsequently dry up. Expect the kids to be weaned by the age of 6 months. If you want a steady supply of milk from your doe, she requires annual breeding and kidding. She also needs a period ranging from six to eight weeks with no milk production before breeding. That time allows her body to recuperate from the previous lactation and mammary tissue to regenerate. Goats in dairy production shouldn't have longer dry periods. That can lead to unnecessary weight gain and kidding difficulties. Drying your doe requires you to change her diet to food with little moisture. You also cease milking her. She won't be comfortable until her milk dries up, a process that takes about a week. Although her udder is full and she appears miserable, don't give in and milk her. This temporary relief only prolongs the process. It's the actual pressure from the full udder that eventually causes her to dry up. When drying up your goat, don't allow her access to lush pasture. That only prolongs the process. Place her in a dry lot or an area with poor quality vegetation. You can feed her grass hay. Rather than allow access to water at all times, as is normal practice, let her drink from a bucket of water in the morning, afternoon and evening and take it away afterward. You only need to restrict her water ration for a few days -- by that time, she will start drying up. If your dairy goat kids but doesn't produce much milk once back in the production line, resist the urge to breed her again quickly. That could compound the problem, as she's likely to continue drying up too soon after subsequent births. Instead, have your veterinarian examine her for any health or reproductive problems.